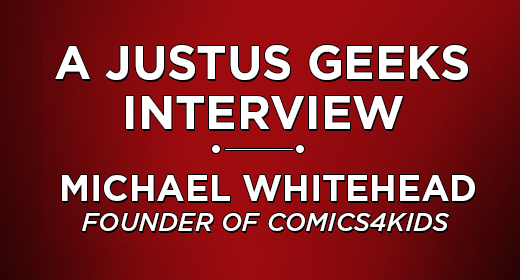 Click here to listen to our one-on-one interview with Comics4Kids founder Michael Whitehead! Michael Whitehead is the founder of Comics4Kids, which we featured in an interview previously on the podcast. In the last few days Whitehead and Comics4Kids has come under fire after a social media inquiry about a photo posted to the official Comics4Kids Twitter account resulted in Bleeding Cool article that set the online comics community in an uproar. In this interview you’ll hear Whitehead’s account of the past few days, and what has lead him to close his non-profit and reopen Comics4Kids as a business. WE WANT TO HEAR FROM YOU! Leave your comments and questions below. @JustUsGeeks thanks for giving me the chance to speak on your podcast. @JustUsGeeks @comics4_kids What I’ve heard so far: Whitehead doesn’t have a plan for his new business and he calls @MarkWaid a backtracker. @JustUsGeeks @comics4_kids is no longer taking monetary donations. Great decision. @JustUsGeeks @comics4_kids admits he wasn’t educated on nonprofits. 26:08. Hope you do research before accepting more donations. @JustUsGeeks @comics4_kids More cleared up in this interview than I expected, but I still see no reason why this org deserves respect. @burntweiners @JustUsGeeks @comics4_kids I’m only 12 minutes in, I am floored…floored I tells yeah. @BFCsMike @JustUsGeeks @comics4_kids what is the point chosing ur choice quotes from the entire pod? It’s all been covered. Let it rest now. @HairHands @JustUsGeeks @comics4_kids I’m pointing out relevant facts and errors of fact. People use quotes all the time. @comics4_kids @HairHands @JustUsGeeks I don’t care about attention. I do care about truth. You’re the one talking up your # of followers. @HairHands @JustUsGeeks A lot of it is worth repeating, as @comics4_kids seems to forget certain facts. @HairHands @JustUsGeeks @comics4_kids Also as some people new to the story are asking “what’s going on?” Let’s keep the facts fresh. @BFCsMike @JustUsGeeks @comics4_kids some learn and move on others like to hold a grudge and jump on band wagons. @JustUsGeeks pass on listening to this. whitehead makes me wanna puke. Stay Classy with this new Teaser Trailer from Anchorman 2!